Fisher-Price Baby Accessories Fisher Price Soft Grip Spoons Just $7.45! Down From $14.99! You are here: Home / Great Deals / Fisher-Price Baby Accessories Fisher Price Soft Grip Spoons Just $7.45! Down From $14.99! Sears has these Fisher-Price Baby Accessories Fisher Price Soft Grip Spoons on sale for $7.45(Reg. $14.99)! 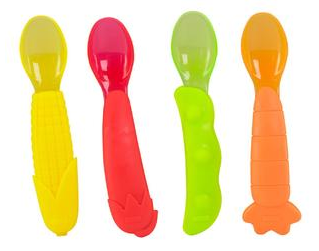 The Soft-Grip spoons are an easy to hold spoon set in colorful, recognizable veggie designs. Handles are soft and easy for little hands to grip. All four have a deep spoon for easy scooping. Spoons are BPA free and dishwasher safe. Four spoons are included.